The Australian team of Richard Green and Brendan Jones combined to shoot an 11-under 61 on Thursday to take a two-shot lead after the first round of the World Cup of Golf. Green and Jones had two eagles and seven birdies at Mission Hills Golf Club and began their quest for Australia’s first victory in this event since 1989. The host of last week’s Presidents Cup — won by the United States — Australia has won the World Cup four times out of the 55 previous holdings. 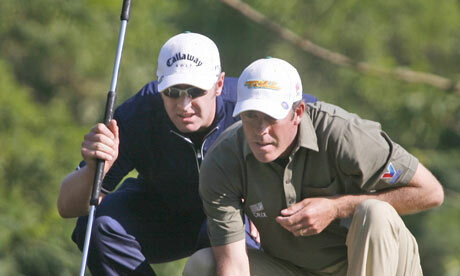 This duo has some familiarity with one another, finishing in a share of third in 2008. Graeme McDowell and Rory McIlroy, who, as team Ireland, are the likely favorites in this event, share second with Scotland (Stephen Gallacher and Martin Laird) at nine-under 63. Team USA, made up of Gary Woodland and Matt Kuchar, share fourth with the Netherlands (Robert-Jan Derksen and Joost Luiten) at eight-under. Colombia, Denmark, Spain and Germany are tied for sixth at minus-seven. Francesco and Edoardo Molinari, both of whom make up Team Italy as the defending champions, struggled on the front nine before making a late run. They had only one birdie through the first 11 holes before making four birdies in the final seven holes to finish at five-under 67.